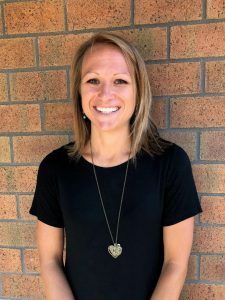 COLD SPRING, MN – Cold Spring Brewing Co. (CSBC), the #1 producer of exclusive beer and craft beer brands for major retailers throughout the world, is pleased to announce Kayla Stang as Front Desk Receptionist. Born and raised in Cold Spring, Kayla’s roots run deep in the community. Living in Cold Spring all her life, she grew up just a few blocks away from the historic brewery. She joined the CSBC team two years ago, after working as a staffing coordinator in the healthcare industry for eight years. The experience she gained in coordinating, planning and effectively communicating have all been beneficial in her role at CSBC. Kayla’s love for people helps provide a warm and friendly face to everyone who visits CSBC. She is the first stop for customers, vendors and employees as she helps guide and direct them to where they need to be. She acts as the “switchboard” for the brewery, answering every call and knowing where everyone is at all times. Working at a brewery was not something Kayla had pictured herself doing but in her time at CSBC, she has grown to appreciate the industry. Kayla loves the variety of beers offered by Third Street Brewhouse and appreciates the uniqueness of each brew. One of her favorite seasonal brews, Sun Seeker Shandy, reminds her that the craft beer industry is all about trying something new and being creative in the brewing process. Third Street Brewhouse Taproom is open on Fridays from 4-9pm and Saturdays from 1-7pm during the summer months. Visit Third Street’s website at www.thirdstreetbrewhouse.com for additional information, locations and a full list of beers.